This earthernware dish has been shaped for cooking chicken or other fowl. It can be used for cooking vegetables or other meat, as long as the flavours of the food don’t clash. The clay walls of the pot are unglazed and therefore porous. Flavours from the food are released and absorbed during cooking. The more the dish is used, the more flavoursome food cooked in it becomes. To cook your chicken, place it with seasonings, herbs, spices, vegetables and/or wine, straight into the dish and into the oven. For a slower method, soak one or both parts of the dish in water for 10 minutes before adding the food and placing in the oven. The porous walls of the dish will absorb the water, and for the first part of the baking, the food is steamed. Alternatively you can add stock or wine and cook in it rather like a casserole. You need less liquid than usual because less of it escapes during cooking. Don’t subject your dish to sudden or extreme changes in temperature, such as placing it on a cold surface straight put of the oven or putting frozen food in it and into the oven. You can place it on a naked flame or element when the dish is already hot, for example straight out of the oven to stove top to make gravy, and increase the heat gradually. As with all ceramic cookware, you must make sure the dish contains liquid if it is in immediate contact with a heat source, otherwise it will crack. After cooking, rinse the dish in hot water and scrub to remove food particles. Don’t use detergent or soap and the porous walls will absorb this too. Dry the dish thoroughly (in the oven is a good way). Store in an airy place. 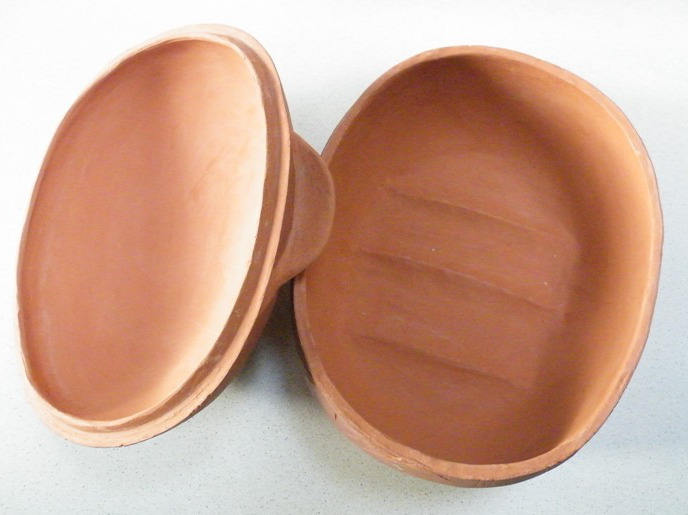 What’s the difference between soaking your terracotta baking dish and not soaking it? Here is a ‘before and after’ view of a simple meal that I cooked in my baking dish using the soaking method. ‘Ceramicus’ opened Thurs 12 Oct at Academy of Fine Arts on Wellington waterfront, till Sun 29th. Ceramicus is Wellington Potters’ Annual exhibition, this year selected by Richard Stratton. Its accompanies by Wellington Waters Colours annual exhibition. These Naked Raku are from my Kereru series, in the show..
All content copyright Rosemary O’Hara 2015.